Oil & Butter: Has it been 1 year already?! Has it been 1 year already?! So much has happened in this one year - I’ve met some outstanding soaping friends and learned so much along the way. I’m really looking forward to continued learning and all the exciting things that this next year will bring! 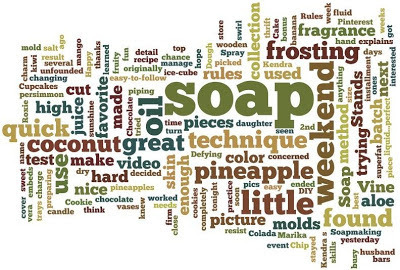 To celebrate this milestone, I thought it would be fun to generate a word picture pulled from my blog text, it’s no big surprise that the word I use most often is ‘soap’!!! Thanks so much for sharing this last year with me and your continuous support and encouragement. It’s Canada’s Birthday tomorrow, so a long weekend for us here…hope you all have a great one! 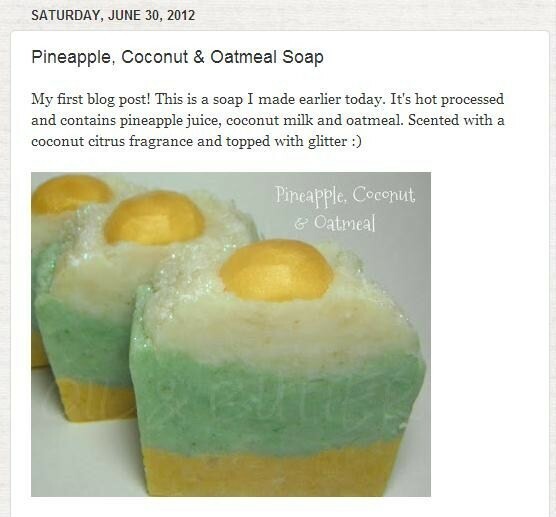 I´ve enjoyed your blog so much and hope that you will continue soaping and writing for years. Aw, you guys are so sweet...thanks! It's been a pleasure getting to know you all better and following your blogs too, I learn so much from you too! Congratulations Cee! I can’t believe that one year can pass so quickly! I really enjoy reading your blog and moreover the opportunity to try your soaps. I whish you to continue in same manner: so many new soap projects and, of course, many more “Oil & Butter” posts! Thank you Gordana, I've really enjoyed reading and learning from your blog too! Thanks Anne-Marie, I had my doubts on whether I would be able to keep it up, but so far, so good! Congrats, Cee Gee, and happy blogging anniversary! I've enjoyed reading about your soap journey and getting to know you better over the past year. Looking forward to seeing many more of your blog posts in the future! Thanks Jenny, yours was one of the first blogs I started following, and it's been a pleasure following you the past year too! Happy b-day to Canada and happy your first one! Really, it's been a year already!? That means I started to follow your blog from its very beginnig,...well, I wasn't aware of this! May you have many, many happy, sudsy years to come, I'm sure it will be fun! Yes Maja, you are one of the old-timers here! ;) I've really enjoyed watching your soapmaking grow over the past year also, you must be almost reaching the 1-year blogging mark soon too? Not that soon! I started it in November,so a few months still to go! Happy Canada Day Cee! 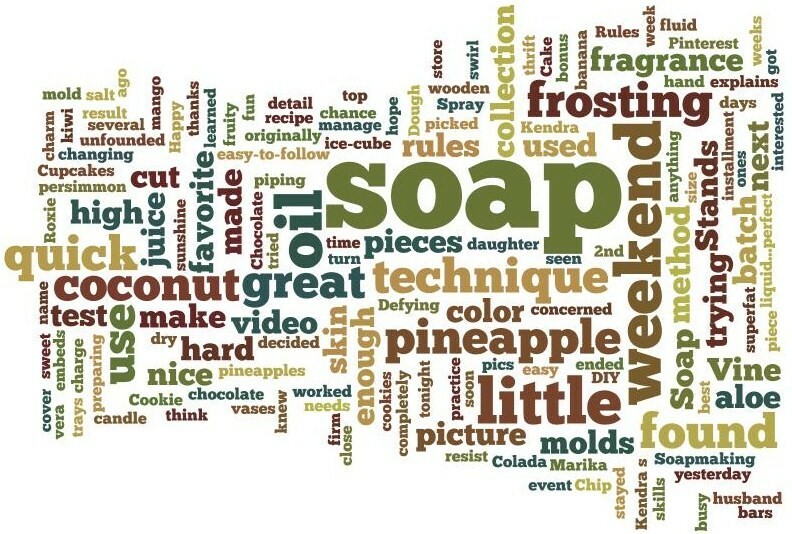 Your first soap is fantastic and your soaps are such an inspiration. Here's to many more years of blogging, cheers! Congratulations, Cee! Your blog is one of my favorites! Wish you goodluck and at least as many soap adventures as last year! Thank you Natalia for your good luck wishes...I really appreciate it! 3 Studies REVEAL How Coconut Oil Kills Fat. This means that you literally burn fat by eating coconut fats (including coconut milk, coconut cream and coconut oil). These 3 researches from major medical magazines are sure to turn the traditional nutrition world upside down! (VIDEO) Want your ex CRAWLING back to you...? Shampoo bars you will love and an update! Neroli, Amber, Rose...oh my! And Mad Oils!